Astronomie - UNLV Study Unlocks Clues to How Planets Form Astrophysicists discover a large population of potential young planets in distant solar systems. Raumfahrt - We have the technology to build a colony on the moon. Let’s do it. Astronomie - Brightest comet of 2018 to pass the closest to Earth in December The comet 46P/Wirtanen was one of three comets discovered by Carl Wirtanen in 1948 at the Lick Observatory in California. The crew had been announced a year earlier, in September 1987. 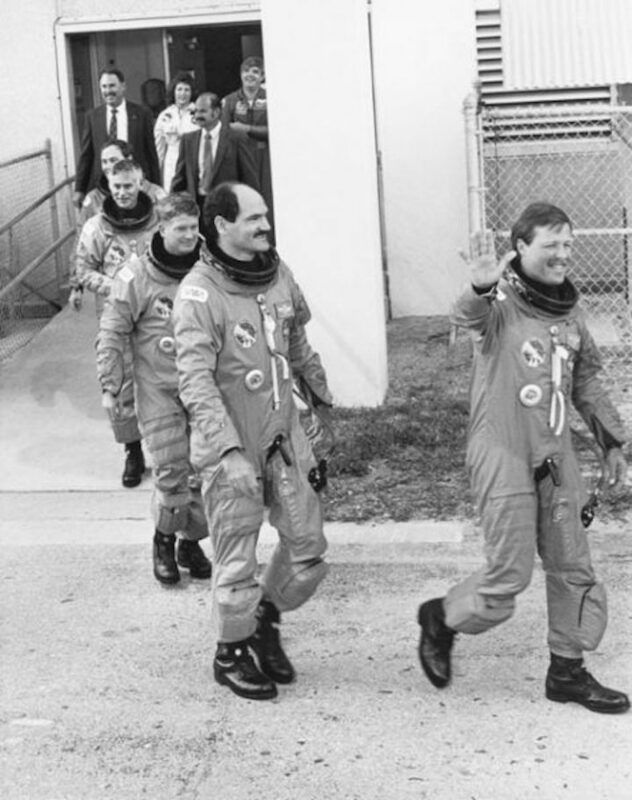 Gardner, Mullane and Ross had been training at the time of Challenger’s loss to fly the first shuttle mission out of Vandenberg Air Force Base, Calif., whilst Gibson and Shepherd were new additions. During their training, they earned the nickname “Swine Flight” from the astronaut office secretaries, and were even given novelty pigs’ snouts, as a result of Gibson’s penchant for making animal-like snorts whenever attractive women were in the vicinity. 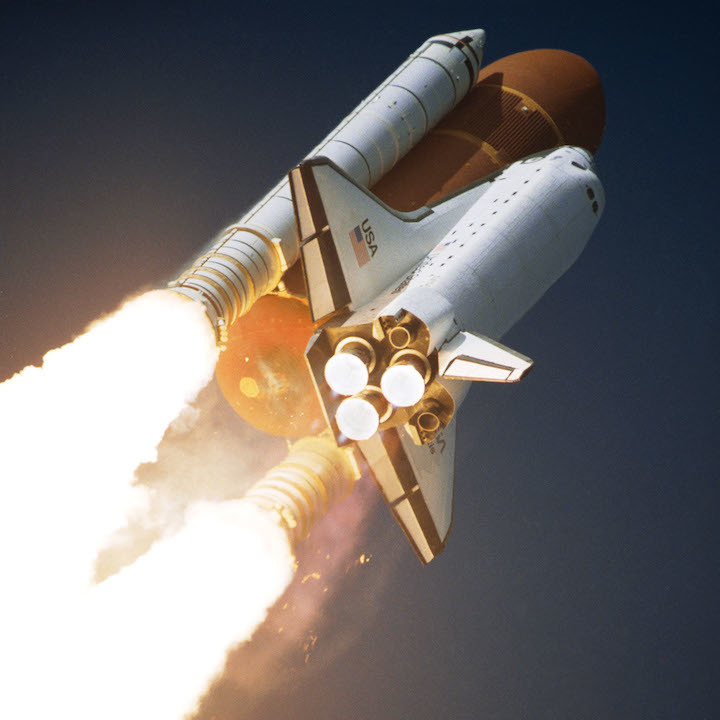 As a secret mission, not even the launch time of STS-27 was released until 24 hours prior to T-0. Years later, in his memoir, Riding Rockets, Mullane remembered that the flight software was classified, and Ross noted that they worked in secured training facilities, which were electronically “swept” to ensure no inadvertent electronic or voice signals getting in or out. “It constrains you significantly on how and where you can do business,” Ross told a NASA oral historian, adding that he sometimes could not even tell his wife where he was going or when he might be home. Not for five years after the mission were the crew permitted to reveal even the slimmest of facts: that they utilized the shuttle’s Canadian-built Remote Manipulator System (RMS) to deploy their classified payload. Launch was originally targeted for 1 December 1988, but was scrubbed, due to unacceptable cloud cover and strong winds at the Kennedy Space Center (KSC) in Florida. 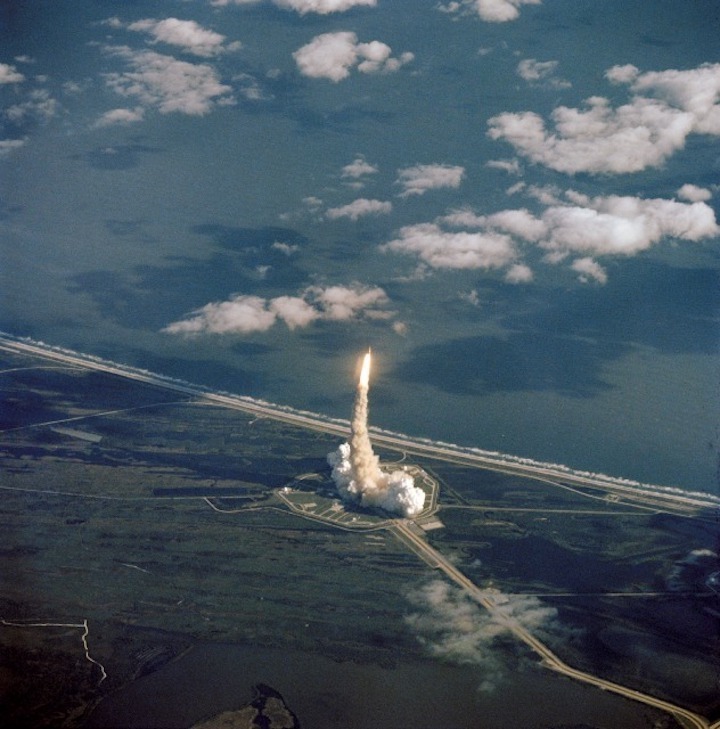 Next day, conditions were more suitable, and Atlantis sprang from Pad 39B to begin her third orbital voyage. Nine minutes later, the astronauts reached space, albeit not safely. 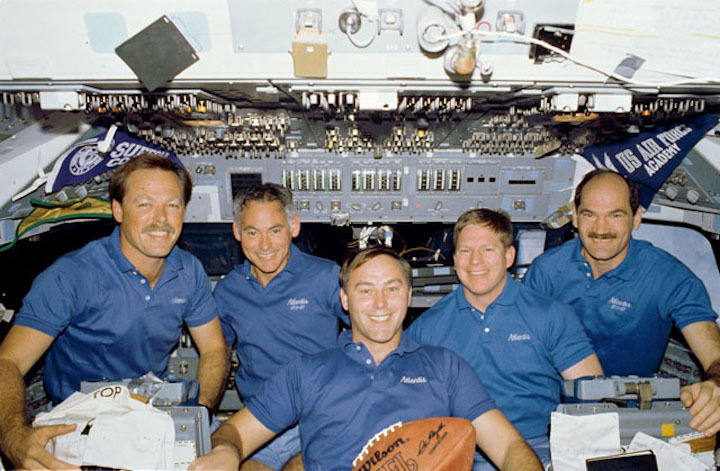 The events of the next few days would highlight how fine the line was between success and failure on a shuttle mission. And it was not until after STS-27 ended that the crew—and flight controllers—became fully aware of how close they came to death. Downstairs, in the airlock, Shepherd watched through a porthole to ascertain clearances between the giant satellite and the payload bay envelope. 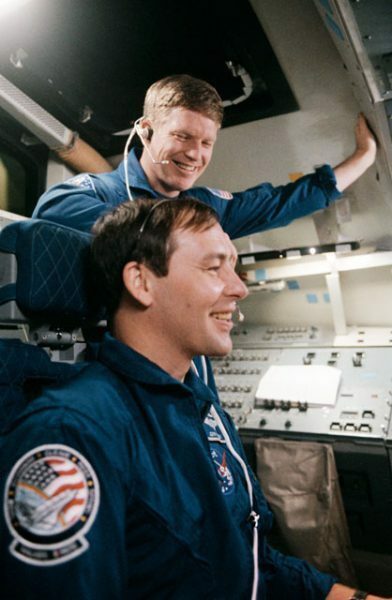 At length, Mullane “flew” the payload to its deployment attitude and flight controllers issued a “Go” for release. Images purportedly showing a Lacrosse under construction in the 1990s illustrate a giant beast of a satellite, costing around a billion dollars per unit, and equipped with a large radar antenna and solar arrays whose total wingspan might have reached 165 feet (50 meters). Gibson reported the extent of the damage to flight controllers, but the response came back that the images did not look to represent a significant breach of the TPS. Worse, the astronauts’ downlinked data was encrypted for security and its slowness meant that the images received on the ground were of low quality. Flight controllers were convinced from the grainy images that the damage was not severe and that the crew were mistakenly seeing damage in conditions of poor lighting. For his part, Gibson was furious and certain that Atlantis had sustained severe damage. He told his crew to enjoy the final days of the flight. “No use dying all tensed-up,” he said. Early on 6 December, after four days in orbit, Gibson fired Atlantis’ twin Orbital Maneuvering System (OMS) engines to begin the hour-long hypersonic descent back to Edwards Air Force Base, Calif. As they descended across the Indian Ocean, streaked across Australia and over the darkened Pacific Ocean, Mullane wondered what was happening as the orbiter’s belly steadily heated up beneath them. None of their flight deck instruments showed the temperature of Atlantis’ skin—only flight controllers had that data—and at length the shuttle passed through the region of peak heating. Traveling at five times the speed of sound, Gardner deployed air-data probes from the nose to provide airspeed and altitude data. 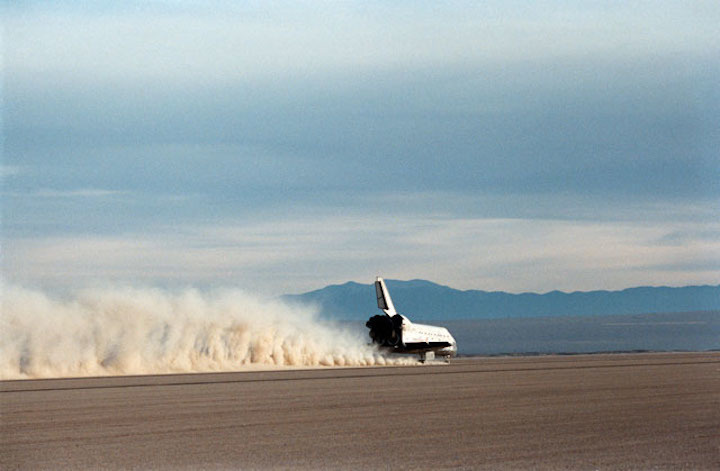 On STS-27, Atlantis and her crew were lucky, touching down on Edwards’ dry lakebed Runway 17 at 3:36 p.m. PST (6:36 p.m. EST), after a mission of four-and-a-half days. When the astronauts disembarked, they saw a gaggle of engineers gathered around the shuttle’s nose, shaking their heads in disbelief at the extent of the damage. More than 700 tiles had been damaged and one, close to Atlantis’ nose, was missing. The damage extended right from behind the nose cap, along the belly and stopped just short of the wing leading edges. The rudder speed brake had been hit repeatedly and the OMS pods hat 14 impacts. It began to dawn on everyone that Gibson, Gardner, Mullane, Ross and Shepherd had cheated death by a hair’s breadth. A TPS damage review team subsequently traced the cause to a change in the manufacturing process of SRB materials, which was intended to improve the performance of the ablative materials needed to protect the boosters from aerodynamic heating. But in Gibson’s mind, better had proven the enemy of good enough on STS-27; if the system worked, there was no need to change it. More significantly, this was only the second mission after the Challenger tragedy. Had STS-27 not made it home safely, 30 years ago this week, it is highly probable that America’s shuttle program would have breathed its last breath.